Estonia took over the presidency of the Council of the European Union on 1 July. 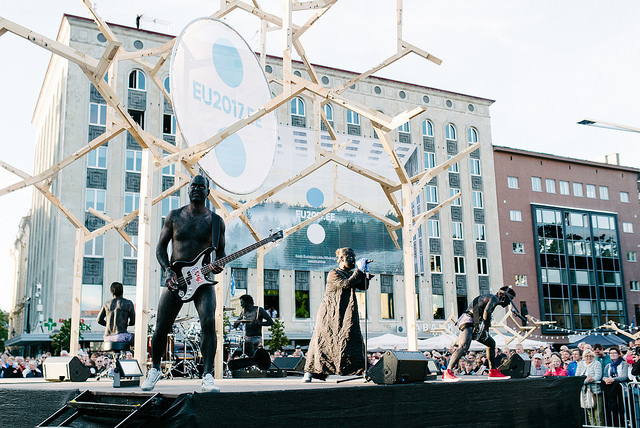 Last Thursday 29 June, Tallinn Music Week, in collaboration with an extended creative team, organized a free concert on Tallinn’s Freedom Square to mark the start of the presidency, attracting nearly 15,000 people. The line-up of the opening concert featured popular Estonian artists like Kukerpillid, NOËP, and Winny Puhh. The square, featuring wood installations that formed a ’digital thicket’, also included cafés and street food stalls, as well as a playground entitled the Children’s Republic. The ’digital thicket’ installation that encompassed the stages and the square told Estonia’s Presidency story ’Unity through balance’. Made of 7 solid cubic metres of wood and 700 identical wooden elements, it was created by Sille Pihlak and Siim Tuksam from the PART architectural practice, the most recent winners of the Estonian Young Architect of the Year Award. Pihlak and Tuksam have also created the timber frame city space bandstands and smart garbage sorting containers for the last two editions of Tallinn Music Week festival. The ’digital thicket’ will find a new home in the Tallinn Botanical Garden as trellises for the climbing plants there. The audience was greeted by Donald Tusk, the President of the European Council, Jean-Claude Juncker, the President of the European Commission, and Jüri Ratas, the Prime Minister of Estonia. “The eyes of Europe are on us and once again we are greater than our size would suggest. We must use this time wisely and boldly, we must speak ourselves but, above all, know how to listen to others. The more familiar Europe is with our way of thinking, the greater Estonia is. The better we understand others, the more united Europe is,” said Prime Minister Ratas. Donald Tusk noted that coming from Poland, he can understand the importance of language in preserving cultural identity and quoted, in Estonian, the poem “We keep together like this” by Paul-Eerik Rummo from 1964. 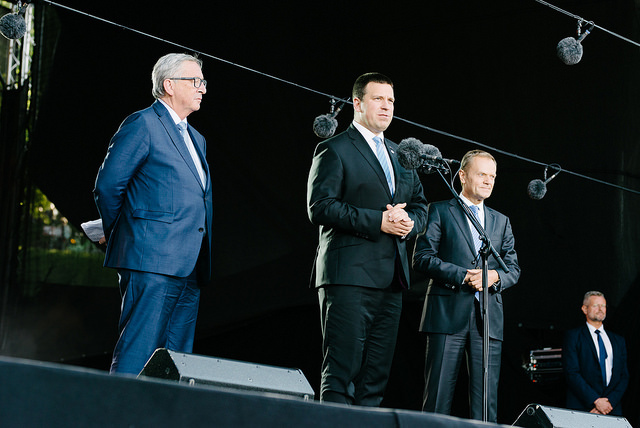 On Friday 30 June, Jüri Ratas and Jean-Claude Juncker gave a joint press conference at the Tallinn Creative Hub (Kultuurikatel) where Juncker praised the opening concert, highlighting the enthusiasm of and the warm welcome given by the people of Estonia. The start of the Estonian Presidency of the Council of the EU was also celebrated at the Tallinn Creative Hub (Kultuurikatel) on Thursday with a formal reception and gala concert for select guests. Both events were broadcast live by the Estonian Television (ETV). The opening concert of the Estonian Presidency of the Council of the European Union concert featured artists like the Estonian Radio Children’s Choir conducted by Kaie Tanner and Kadri Hunt, the Estonian Cello Ensemble, Estonian Voices, Frankie Animal, Genka, Kadri Voorand, Kukerpillid, Mari Jürjens, Miljardid, NOËP, Vaiko Eplik, Winny Puhh, and a joint choir with conductor Veronika Portsmuth, and dancers with choreographer Arolin Raudva. The performances were blended into a continuous whole by composer and DJ Sander Mölder. The concert was organised by Tallinn Music Week and Kingent Management.